On trial with the Red Bulls this week is an Attacking Midfielder by the name of Wuilito “Totti’’ Fernandes. He's a 20yr old from Cape Verde, who's recently played in the New England Luso American Soccer Association. Another player currently on trial with the Red Bulls is Sheanon Williams, a US U20 MNT player, who most recently played for the Harrisburg City Islanders. He impressed the Red Bulls coaching staff during the Islanders shock US Open Cup elimination of the Red Bulls back in late June. He further impressed the coaches during his trial last week and was given a second week to show his stuff. Red Bulls forward Juan Agudelo has, once again, been called up to the U20 USMNT for a 4 team tournament taking place next month in Peru. According to this story, Coach Backe would be happy with TH14 even if he didn't score a goal for the next two years. All righty then! If you missed the "Thierry Henry: The Next Goal" documentary that aired on FSC (I believe it aired before the RBNY/Galaxy game) then click here to watch. Recently waived Red Bulls Defender Kevin Golthwaite has been signed by the USSF D2 Portland Timbers. As you might know, the Timbers will join MLS next season so Goldie could yet play @The Cathedral of Football. Good Luck Goldie! The Red Bulls will host a School Drive to benefit needy school children during this Saturday's game against SJ. 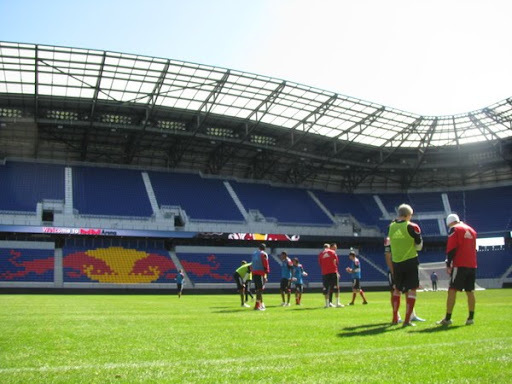 After Saturday's game, the Red Bulls host the 2nd annual Mayor's Cup charity game, between the respecive soccer teams of NYC's Bravest & NYC's Finest. The Rafa Marquez golazo against TFC is up for goal of the week. Please click here to vote for Rafa (ends at midnight tonight). Check out this story, from mlssoccer.com writer Kristian Dyer, about Chris Albright's comeback. Picked up by RBNY on waivers (from the Revs), Albright is quickly becoming the "Steal of The Year". Sport Illustrated's Grant Wahl gives us this great analysis of the recently released MLS player salaries. Did you know that RBNY leads the MLS pack with a total salary number of $15,666,639? Also in this article is a great analysis of the Most overpaid and Least Underpaid MLS players (did you know Timmy Ream only makes $40,000?). I've been thoroughly entertained by the absurd goings on in the Concacaf Champions League this week (as pertaining to the MLS participants). Nothing, however, comes close to the epic collapse by Real Salt Lake against Mexico's Cruz Azul yesterday. This match was played in a downpour that turned the field into a swamp and featured an insane final 5 minutes. If you missed it, check out the highlights by clicking here. That's it for now. Hope to see you all on Saturday. Viper Out!